You are currently browsing the monthly archive for August 2006. 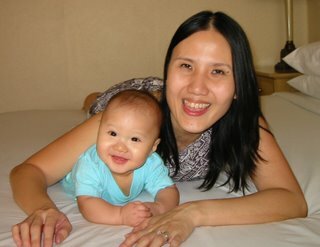 I’ve heard that breastfeeding supposedly becomes easier when baby attains the age of 6 months. 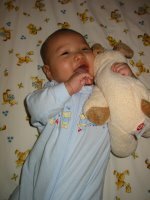 Well, when I first started breastfeeding Ethan, it was certainly no walk in the park and at that time, I could not wait till he was 6 months old. I was under the impression that once he reaches 6 months, he would not be so dependent on milk as he would already start on solids.6 months has come and gone, and I must say that I am quite wrong about him being NOT so dependent on my milk. Yes, Ethan has been taking rice cereal for about 3 weeks now and yes, he appears to be enjoying it, but I am happy to note that he STILL prefers what he knows is BEST: Mommy’s Milk. 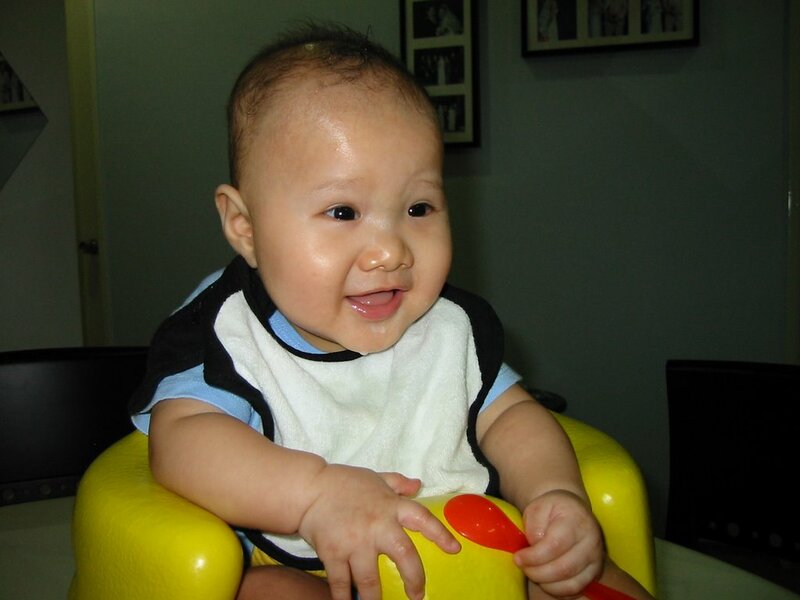 To date, he is taking a few spoonfuls of cereal mixed with fruit or vegetable (he loves pears, carrots and apples) at lunch time every day and completes his meal with milk. Sometimes I will give him some fruit for dinner when I get back from work. I’ve read that up till the age of 1, a baby’s diet is to comprise mostly of milk in order to provide adequate nourishment. I’m glad our Ethan is doing a great job in fulfilling this fact. 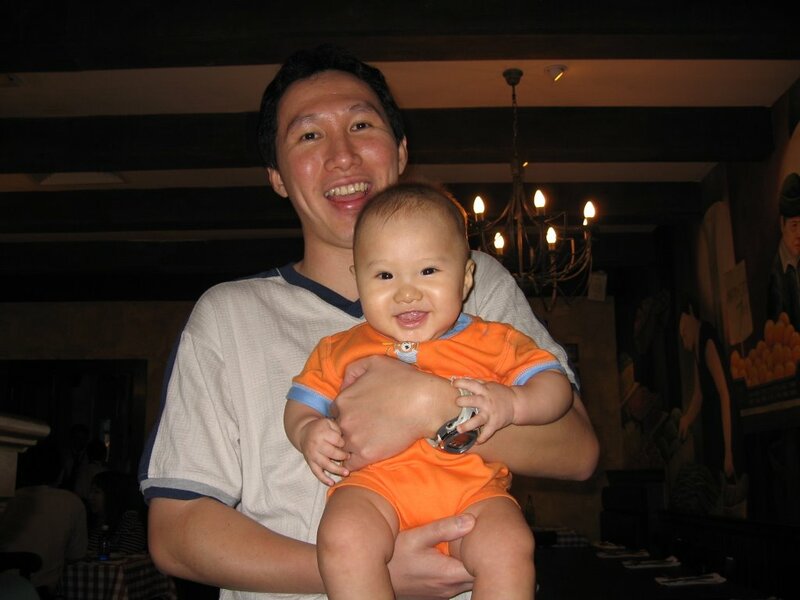 I’ve watched our boy grow from a small fragile infant into an active and bulat baby. I’ve watched him mature from crying for every single thing to babbling incoherently to giggling uncontrollably when he plays. 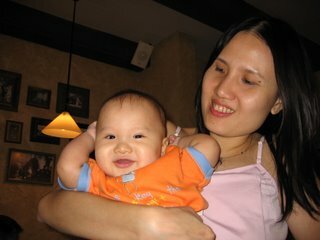 It is so very rewarding to witness this miracle of growth, to have my spirits uplifted each time I am greeted with that toothless grin, that gentle touch and those big loving eyes…and to know I have provided him the best by breastfeeding. What a blessing Ethan is to us! I know I will miss being his sole food provider in future as he grows up, but for now, I will enjoy this magical bond we share. And I know I will never forget this experience for the rest of my life. Last day of our trip. 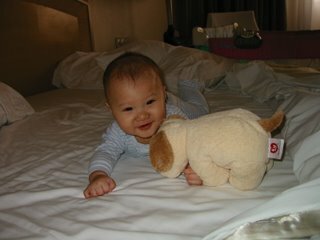 Despite having to pack extra stuff because we had Ethan along, we enjoyed the trip very much… I think Ethan had a lot of fun, especially rolling around on the hotel bed. 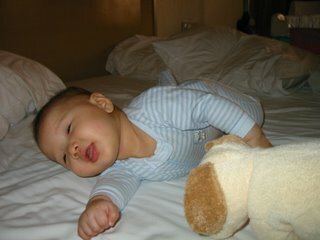 He seemed to prefer the bed and room in Sheraton Subang though. Plus he felt right at home, cos we brought some of his favorite toys along too. Had lunch at 1-Utama where we again checked out the nursing facilities at U-Parkson Ethan wasn’t hungry then, so we only changed him. 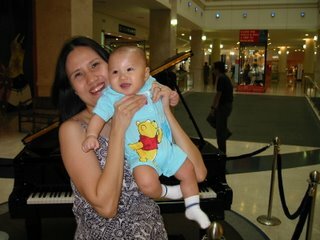 He was SO excited that he kicked and squealed in delight, much to the amazement of the other parents there! Aiyo…I tell you, our boy really full of energy man! After that fresh diaper change, it was homeward bound…. Buhbye KL! We’ll come back again soon! Got up early for breakfast at the hotel. Well, actually Ethan was up early so we had to wake up early too. After breakfast, we got ready to go out shopping (again!) 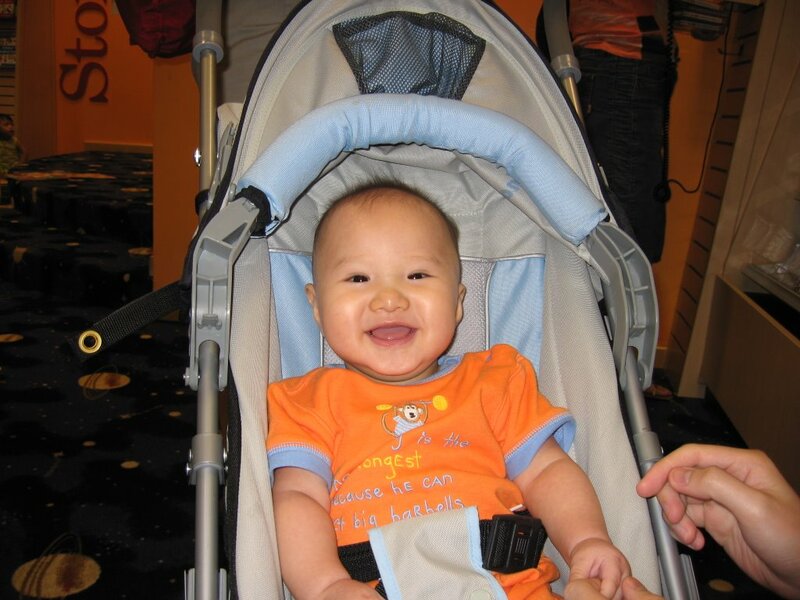 - today is Ikea day!Managed to get the Ikea high chair for Ethan and amid all the rush, we managed to breeze through shopping in about an hour! That’s a record for us, okay? 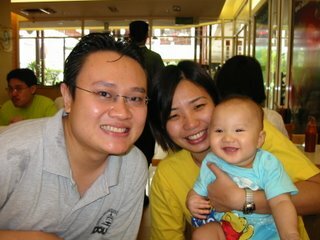 Met up with Ethan’s Uncle Allan and Aunty Pei Gee for lunch at Pho Hoa. Awesome Vietnamese cuisine. Ethan couldn’t keep still (again!) so had to carry him and walk around most of the time. After lunch, we checked out of the hotel and headed to Sheraton Subang. We decided to stay at Sheraton cos that’s where the wedding dinner would be held and it would be more convenient in times of “emergency”. 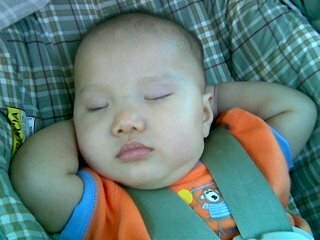 Ethan fell asleep on the way to Subang. Actually I am beginning to believe that the car really works wonders to provide a soothing feeling for a baby to fall asleep. We checked in and barely had time to freshen up and then rushed to church for the wedding. The reception followed soon after - yup, you guessed it… Ethan could NOT sit still again! Pete and I had to take turns carrying him around the reception hall. He was really in his element, demanding all the attention he can get. 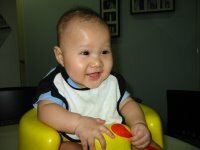 In spite of this, he still managed to look really adorable and oh-so-bulat! Towards the end of the dinner, he (finally) fell asleep on my shoulder. 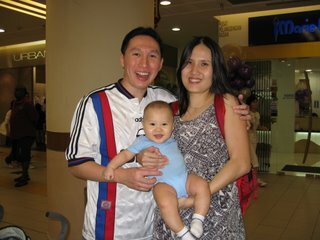 We had a wedding to attend in KL so it was the perfect opportunity for us to take Ethan on his first trip. Plus, here was also a good excuse to frequent our favorite store Ikea. It was my first trip out of Penang since I had Ethan, and as we cruised across the Penang bridge, I had poignant memories of heading the other direction towards Penang the first day of Chinese New Year this year as I had mild labor pains then.Ethan fell asleep not too long after we passed the Juru intersection and slept for like 30 minutes at the most. He became fidgety upon waking so we decided to make a quick pit-stop at the Sungai Perak rest area, where I breastfed him in the hopes of appeasing him a little. Heh. Well, we arrived in Ipoh a short while later, where we had Mom’s delicious lum mee. Yummy…It was nothing short of excellent! Ethan had a little of his cereal with pear. Grandma and Grandpa from Ipoh were bowled over by Ethan’s antics and I am sure they had a field day feeding him. Before leaving Ipoh, I fed Ethan again and then we were on our way. He put up a fuss while we were headed for the Ipoh(S) exit (missing AKong and AMa??) but miraculously, he fell right asleep when we crossed the intersection. Even more miraculous was that our boy slept for 2 hours straight, right till we reached KL and checked into the Royale Bintang Damansara Hotel! We rested (yeah right!) in the hotel for a couple of hours and then decided to go for stroll in The Curve. 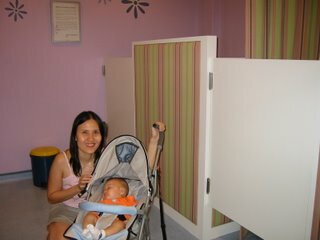 Ethan had his dinner in the Baby Care Room in The Curve, which was SO comfy that he fell asleep then and there after his feed! Went to check out Borders at The Curve, where Ethan had a good time smiling at everyone there. 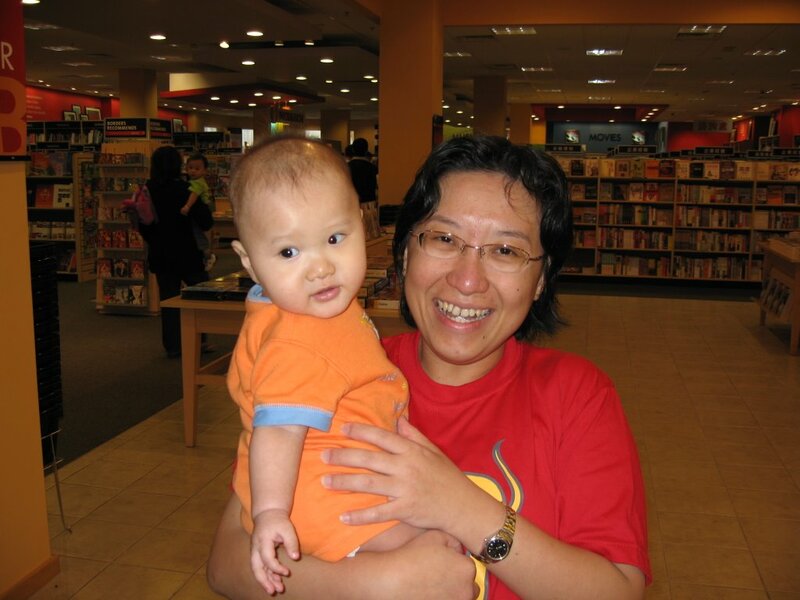 When his Aunty Pauline showed up with a miniature Barney, Ethan started giggling uncontrollably! Hehee…. At the time, we were really hungry and ended having fabulous Italian food at Italianees. Our boy was the center of attention there. Couldn’t stay still and kept requesting to be carried around. Baby chair didn’t help either, cos he would try to escape from it! After dinner, we went to check out the organic store at Ikano where I bought some red bario rice, millet, quinoa and buckwheat in preparation for Ethan’s porridge in a few weeks’ time. We then headed back to the hotel, very full but also very tired. Hope we’ll be able to keep up with Ethan the next day! 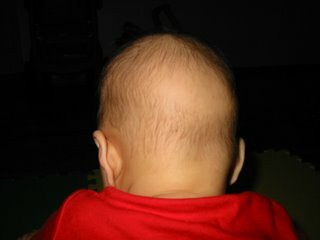 Ever since our Ethan boy was born, he has very little hair. 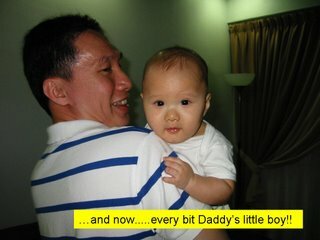 In fact in the early weeks, I jokingly referred to his lack of hair as premature baldness or male-pattern baldness. 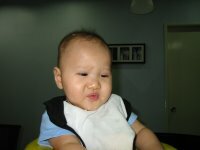 He used to have 2 patches of hair on the sides and the middle portion of his head was bald. Then slowly the hair in the middle portion of his head began to grow to what it is today.However, at the back of his head now, there is still a bald patch with virtually no hair. 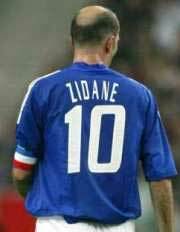 We call it the Zidane patch, after the great footballer Zinedine Zidane. Does this indicate our boy will follow in the footsteps of Zidane with football glory in his future? Determined to get Ethan accustomed to the water, we took Ethan for another dip in the pool. The baby pool was rather hot and unshady and conquered by some other kids, so we took him to the shallow end of the adult pool instead. There was no one there at that time, so it was the perfect opportunity for him to discover the water. 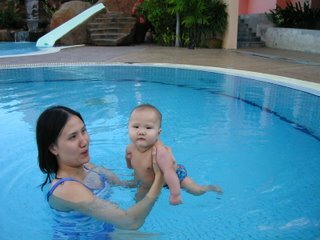 I first went into the pool and showed him how fun it was, splashing on the water. Then when I carried him in, he started kicking his feet!…. and smiling! Slowly I began floating him in the water, all the time talking to him reassuringly. Our boy was enjoying himself! Whee!!! I’m having so much fun!! I’m bored now Daddy… can we call it a day? Six full months of drinking breast milk only has earned Ethan the right to move on to solid food. On the menu today, I prepared rice cereal mixed with expressed breast milk, stirred to a runny consistency. We put him in his yellow Bumbo seat, got him garbed in a bib, had a hanky ready and proceeded to feed him.The first mouthful was met with a sour look and a “What’s that you are feeding me, Mommy?” expression. Most of the cereal dribbled out the corner of his mouth though. 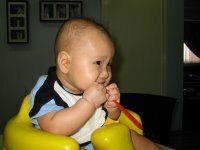 He then grabbed the feeding spoon and began to play with it. Of course, we were hoping he would feed himself la…. hehehe… no such luck as he only used the spoon to hit the Bumbo seat and tried to chew on it. 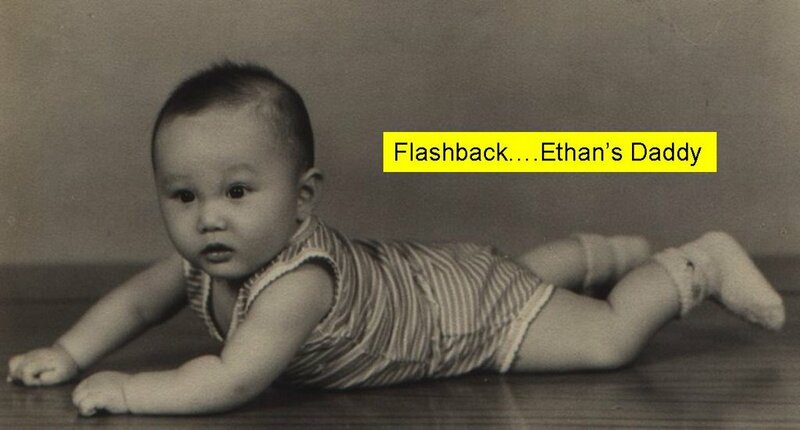 Ethan has said his first word. It ain’t “Daddy” as was expected. And it ain’t “Mommy” too. There ain’t no “dada-baba” sounds either. During playtime, we would inadvertently hear him go “Where?” over and over and over again. 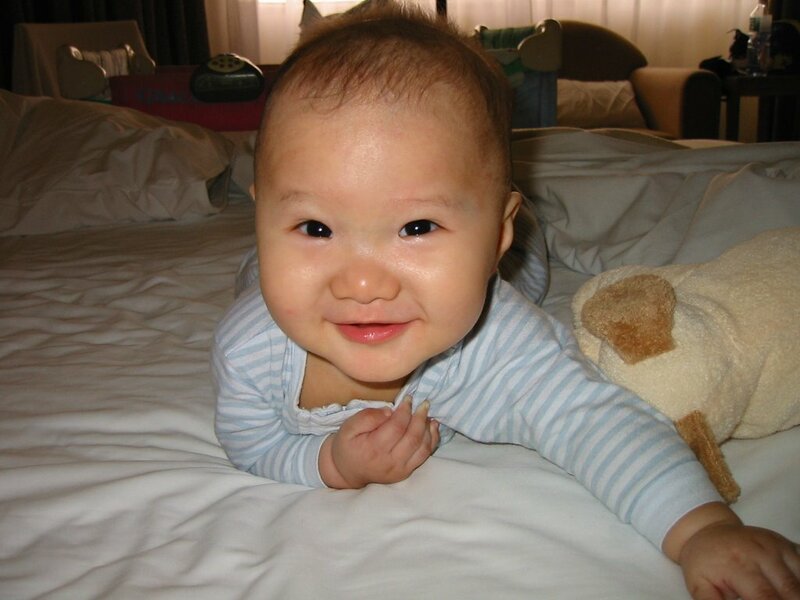 Ah well… shows that he is a curious child anyway….. actually more like kepo. Heh. Wonder whose trait he took after.